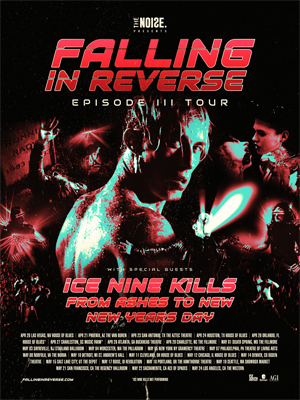 FALLING IN REVERSE have announced their Spring 2019 tour plans. The band will embark on a headline North American tour in April and May. The tour kicks off on April 20 in the band's native Las Vegas and wraps up May 24 in Los Angeles. The band also released two standalone singles: "Losing My Life" and "Losing My Mind". They've reached nearly 25 million combined views since dropping last year.